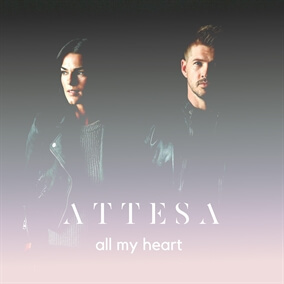 "All My Heart" is the newest single from Austin-based worship duo Attesa. It is a two-part song, with the first being primarily instrumental with an atmospheric tone. The lyrics are a call to the heart of God, expressing a deep hunger for more of Him; to experience more of his presence and life. Part 2 moves into the heart of the song...as it picks up pace, the mood changes. The lyrics are almost the answer or response to the longing expressed in the beginning and it turns into more of a declaration. Attesa shares, "It's our desire that you connect with God and experience His deep love for you through this song." Download your copy of "All My Heart" today on iTunes and pick up the Original Master MultiTracks and instrument parts in RehearsalMix here on MultiTracks.com.